Maxiflex secured an order for an overhead panel sectional door from a leading citrus fruit handling company situated in the Eastern Cape. The customer required a specialised door solution for its new 11 000 m² warehouse with a capacity of handling tons of citrus produce every hour. A quality door solution was essential as product handling in and out of the warehouse must be swift to maintain the facility’s interior temperature in order to reduce the risk of costly produce spoilage and losses. The project was spearheaded by Viaplan Consulting Engineers and Randcivils. With quality product and service support stipulated by the customer as prerequisites, the two companies immediately turned to Maxiflex to provide an optimum door solution. “Maxiflex is known to Viaplan Consulting Engineers and Randcivils as we have been involved with them on a number of similar installations in the area,” explains Bram Janssen, MD of Maxiflex. 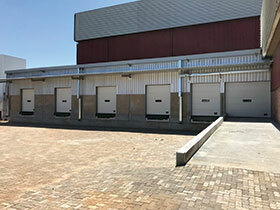 “Once we had identified the customer’s exact requirements, we immediately knew that the 1042P overhead panel sectional door from Assa Abloy Entrance Solutions would cater to the customer’s exact requirements.” Janssen adds that in addition to its features, the door’s pleasing aesthetic appearance perfectly complements the warehouse’s façade. Ideally suited for warehouses, logistics centres and factories, the robust, flexible, efficient and safe door system presents excellent sealing properties. Each part of the overhead panel sectional door is built to the highest standards to ensure reliable operation even under extremely high workloads and arduous conditions. Made up of 42 mm panels, the door forms a 4-way seal when closed, ensuring insulation from all weather conditions, protecting the fruit inside the warehouse. The door’s design has earned a class 3-certification for water tightness, wind load and air permeability. Furthermore, by helping to regulate the warehouse’s internal temperature, energy costs are kept to a minimum with subsequent costs savings for the customer. “Correct use of the door system is critical as it will extend the product’s lifespan and keep running costs to a minimum for subsequent lowest total cost of ownership for our customer,” notes Janssen. In addition to the already well established sole distributor rights for Assa Abloy Entrance Solutions in sub-Saharan Africa, Maxiflex recently acquired exclusive rights to distribute in southern Africa, Stackdoor, a pioneering security grille manufactured in the Netherlands. “We are very pleased to announce that in the third quarter of 2018, we obtained the rights from American Mine Door to manufacture and install underground ventilation mine doors in South Africa,” concludes Janssen.